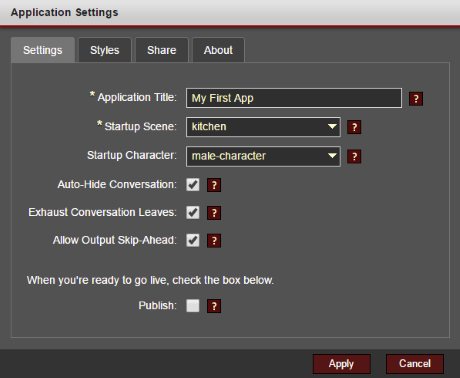 The Application Settings dialog controls various aspects of your app's appearance and behavior. Upon launching the Application Settings editor, you can get additional help by clicking the help icons next to each field. Sets the app title, startup info, conversation behavior, and other global properties. Sets the colors, images, and background behaviors for the background, dashboard, and buttons. Sets the thumbnail and description that should be used when the app is shared on social media. Sets the About details and/or web site that should be displayed in-game.